It was hot and dry here for most of December. Everywhere is looking dusty and there have been water shortages but on the day before Christmas Eve the rain poured down - a great Christmas present for the island although unfortunately it didn't extend to the outer islands which are still experiencing drought conditions. The rain cleared on Christmas Eve afternoon just in time for a dry start to the festivities. The dry spell has continued since then and my water tank was getting low but today we had another short sharp downpour and that's cooled things down and watered the garden just in time for the new year. The fine weather meant I could get to grips with my great Christmas present - a DJI Phantom quadcopter with a GoPro camera to mount on it for taking aerial videos. Awesome! Well, it was once I plucked up the courage to power it up and send it skywards. I had visions of it heading up, up and away and not coming back down. This has happened to other people according to the horror stories you see on the web but mostly people say how much fun it is. Well, I can confirm that it's fun but it's not as simple as some of the online videos make it look! Taking off is OK but some of my landings were a bit rugged. It would no doubt be easier on flatter ground but I'm using a more-or-less flat patch on rough sloping hillside next to my house. There are flashing lights on the Phantom but once it moves away it can be tricky to tell what direction it's facing so you don't know what video you've captured until you get it all back to the computer. Makes it more exciting, but it's one of the things I'm hoping will improve with practice. Here's another short video from this year's Vaka Eiva festival. The Muri beach sprints are always a fun occasion especially when the weather is a good as it was this year. The 500m course heads from the reef towards the beach at Sails with six V6 vaka paddling at a time. While the various heats and final races take place, everyone else can enjoy swimming, food and drink and just chilling out. Video of the recent Vaka Eiva (outrigger canoe) festival on Rarotonga, Cook Islands. More than a thousand paddlers took part in the festival. This video shows some of the one-man (and woman) competitors in the OC1 and V1 categories. The women's race was 12km as was the master men's race. The open men raced over 18km. Vaka Eiva's over for another year and this, the tenth anniversary, was a huge success. Over 1000 paddlers took to the waters around Rarotonga during the week (22 - 29 November) and with all their families and supporters the island was packed with visitors out to enjoy the sporting and other events on offer. The weather was good for the most part apart from a few heavy showers on some days. Can't complain about that though because we've been suffering from a bit of a drought recently. The festival started as usual with a traditional blessing of the canoes. This year there were eight newly built ones and over thirty in all. That's a far cry from the original seven vaka that made up the fleet ten years ago and just shows how much Vaka Eiva has grown over the years thanks to the hard work of organisers and the generosity of sponsors. For more pictures and stories check out Cook Islands News and the website of Harvie Allison, the long-time official Vaka Eiva photographer. Here's the final video from this year's fabulous Sevens in Heaven tournament. Over the three days of competition we were treated to excellent rugby from local and overseas teams. Saturday was the highlight as always. Families and groups of friends and supporters made the most of the great weather with some setting up tents on the banks of our national BCI stadium while others grabbed a bit of shade in the grandstand or chilled out in the bar or VIP area. Plenty of food of course, this is the Cook Islands after all and what's a day out without a feed? Heaps of people got into the party mood by dressing up; some entered the various costume contests but others were just intent on letting down hair and kicking up heels for a bit of fun. One of the great things about this tournament is how good natured everyone is and long may that continue. Thanks to the hardworking organisers and all the teams: Teimurimotia Stallions; General Transport Tabusoro; Porirua Magic (NZ); Atiu Warriors; Tauae Bulls; Araura Enua; Avatiu Rugby Club; Titahi Bay Panthers (NZ); Rebels; Bombay Hawks; Titikaveka Telecom Colts; Tupapa Maraerenga Panthers; Shuzi Flying Dragons; ICBH Arorangi Cowboys; Mareko's and AS Manu Ura (Tahiti). Hope to see you all again next year. Here's more video from this year's Sevens in Heaven tournament (aka the Cook Islands International Rugby Sevens Tournament but that's a bit of a mouthful). All of the sixteen teams make an appearance. These included all-local, all-overseas and local with imports sides. Those taking part were Teimurimotia Stallions (last year's champs, this year's runners up); General Transport Tabusoro; Porirua Magic (NZ); Atiu Warriors; Tauae Bulls; Araura Enua; Avatiu Rugby Club; Titahi Bay Panthers (NZ); Rebels; Bombay Hawks (NZ - this year's champs); Titikaveka Telecom Colts; Tupapa Maraerenga Panthers; Shuzi Flying Dragons; ICBH Arorangi Cowboys; Mareko's and AS Manu Ura (Tahiti). The rugby at the recent Sevens in Heaven tournament was great but so was the entertainment. The players had a bit of a rest on Friday and Saturday while various novelty contests took place and the highlight on both days was a performance by local kids and fitness enthusiasts. On Friday five youngsters and three adults strutted their stuff while Saturday's maxi-show featured 14 adults and 27 kids including some really tiny tots. This video is of the Friday performance. The annual Sevens in Heaven rugby sevens tournament has just taken place here on Rarotonga. Once again it was a great success with fine weather (apart from a heavy shower on the first afternoon), exciting rugby, plenty of food and lots of people dressing up and having fun. The only things missing were the women's teams. There hasn't been a women's competition for the past two years which is a shame because their games are always popular with the spectators. Next year is the 25th anniversary of the sevens tournament so let's hope the women are back in action then. As usual the event opened with a march through town followed by a short opening ceremony and the 'dash for cash' run with a speedster from each team sprinting to win $100 for the charity of their choice. More videos to follow so watch this space. Rarotonga is still reeling after two schools were targeted by arsonists over the weekend of 19-20 October 2013. In the early hours of Sunday morning the west wing block at Nukutere College went up in flames. Classrooms, a science lab and the school canteen were destroyed in a huge blaze that started around 1am. The same block burned to the ground in 2006. On Sunday afternoon at about 4pm Avatea Primary School was set alight and the fire quickly spread to engulf an entire block containing six classrooms and the school library. Both fires were started at times when planes were due at the airport so Rescue Fire Service was unable to attend immediately. Engines and volunteers from Puaikura fought the fires until Crash/Fire units arrived. New Zealand fire investigator Peter Wilding arrived on Rarotonga on Tuesday to help local authorities find the cause of the fires and confirmed what everyone suspected – that the fires were started by arsonists. Police say they have about a dozen suspects who are under investigation. Students were all back at school later in the week. Nukutere was able to make room in existing classrooms while Nikao Primary School offered spare rooms to their sister school. The government has pledged that both school blocks will be rebuilt by the time school starts in 2014. Check out Cook Islands News for more about the fires here and here. Hmmm. It’s more than three weeks since I last posted to this blog but never fear, I haven’t disappeared completely, it’s just been a busy time. After getting back from the US I was involved in making a short film, fetching, carrying, holding reflectors and such. It was a follow on from Film Raro earlier this year. The National Women’s Council, a local NGO, wanted to build on the experience of “Little Girl’s War Cry” but to highlight some of the problems that older teens might sometimes (sadly) experience. It was just like old times with many of the Film Raro crew back on board plus a few new faces. Shooting has now finished so we’re all looking forward to seeing first a trailer which should be ready soon and then the finished short film probably in late November or December. The New Zealand Governor-General, Sir Jerry Mateparae with his wife Janine Lady Mateparae, has just made an official visit to the Cook Islands, spending time on Rarotonga and Mauke. Among the events they attended was a traditional welcome ceremony at Atu Pare Marae in Puaikura, hosted by members of the House of Ariki, the Koutu Nui and the people of Puaikura. This video shows some of the highlights. Sir Jerry arrived on Rarotonga on Sunday afternoon and when planes are due or on the tarmac the Crash-Fire Service fire engine has to stay at the airport. And that was the time when the main classroom block at Avatea School caught fire. Massive damage – six classrooms destroyed. And the previous night Nukutere College also suffered huge damage in a fire with a block containing classrooms, a science laboratory and canteen destroyed. Naturally everyone is saying ‘arson’ but investigations are still going on with a fire expert from NZ here to help out. The next post to this blog will have footage of the Avatea fire. It's been a month since my last post as I've been on holiday. We were in the USA visiting relatives and taking cross-country train rides. Spent a few days in Auckland on the way back and now we're home again; time to catch up on the editing. In the meantime here's another short video from the Maeva Nui dance competition. Atiu Enua is known for its bird-life and the 2013 kapa rima (action song) featured a bird theme. Ten teams contested this year's cultural dance competition at Te Maeva Nui, but while the other nine sang a ute, Puaikura chose to perform a pe'e (chant or legend). The pe'e is something of a specialty for Puaikura. The village turns out in full force and the choreography includes some fascinating and unusual moves. And everyone looks as though they are having a great time on stage. It's all a lot of fun. This pe'e is about the coming of Christianity to the village. It might be a while before the next video goes onto the blog as I'm about to go on holiday. Yay! Taking a train across America. I love trains but there aren't many on Rarotonga; just one in fact and unfortunately it's no longer working. This year's Te Maeva Nui dance competition gave local (Rarotonga-based) teams the chance to shine and they certainly made the most of the opportunity. With fabulous costumes, exciting choreography and plenty of new faces, it might not have had outer islanders but it had everything else. One (among many) of my favourite items was the Takitumu ura pau. The ura pau, or drum dance, involves mainly lower body movement, pulsating drum beats and non-stop action. It's always an audience favourite and this one was no exception - you can hear the cheers in the background. All the items last six or seven minutes so this video is just an excerpt. If you want to see the whole thing don't forget the Ministry of Cultural Development will have DVDs available some time soon. One of the first items in this year's Te Maeva Nui competition was the Enua Mangaia dance team's kapa rima (action song). The dancers were mainly Rarotonga-based Mangaians, both young and old, and their kapa rima costumes were among the few this year made from rauti and other leaves. The youngsters put on an enthusiastic performance, much appreciated by the audience. Don't forget, DVDs of Te Maeva Nui competitions are available from the Ministry of Cultural Development. This year's set should be available in a month or so. The annual Te Maeva Nui celebrations on Rarotonga always begin with a float parade along the main road in Avarua. It's a chance for people to dress up and make a lot of noise. The weather started off fine and sunny this year which was great for spectators and performers alike. Later on, as the speeches were getting underway, the rain came down. Didn't dampen the enthusiasm of the paraders though. This year's Te Maeva Nui festival was another wonderful experience even in its shortened form. In order to cut down on expenses there was no government subsidised transport to bring outer islands dance teams to Rarotonga; instead the islands were given cash grants so they could have their own celebrations and competitions. Well, it's always enjoyable to have outer islanders here but many people have pointed out the good things to come out of this. 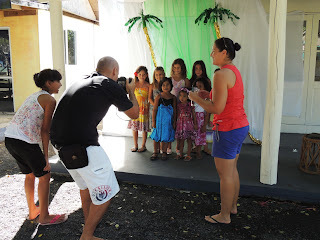 For a start, we had ten teams of Rarotonga villages and Raro-based outer islanders. This meant that all our dancers, young and old, had the thrill of being involved, not just the stars from a few communities. It was a joy to see so many kids up on stage singing and dancing with heart and soul and clearly having a ball! And remember that hours of practice and costume making goes into each performance. The same was true for the outer islands. We've read reports and seen photographs in Cook Islands News of the celebrations on Aitutaki, Manihiki and Mauke. No doubt when travellers get back from the northern group we'll hear about the events up there. Some of these islands had a full programme of dances, including the pe'e, sports and parades. On Manihiki tthe villages had a real float parade - decorated boats on the lagoon! And this year everyone was able to take part instead of sending off the best dancers to Rarotonga. That's the way to keep the culture alive and growing. Here's another short video from last year's Te Maeva Nui. This one is of the Tongareva team with their reo metua. This is, I think, the legend although in previous years it's gone by the name of pe'e or chant. This was a very impressive performance and earned the team an A grade. The Ministry of Cultural Development has a brief timetable for this year's Te Maeva Nui. The float parade is on Monday 29 July, starting at 10am with the opening ceremony planned for 12 noon. These things usually run over-time but this year, with no outer islands groups, the float parade will probably be quite small so maybe it'll start at the designated hour. We'll see. Trade days and the dance competition are scheduled for Wednesday 31 July to Friday 2 August. There are no details on the MOCD website about the teams taking part. Here we area, midway through July and Te Maeva Nui is fast approaching. This year it will be scaled down compared to the last few seasons. The outer islands will be holding their own festivities, no doubt including singing and dancing, but they will not be sending teams to Rarotonga to compete. The main reason is the expense of transport. 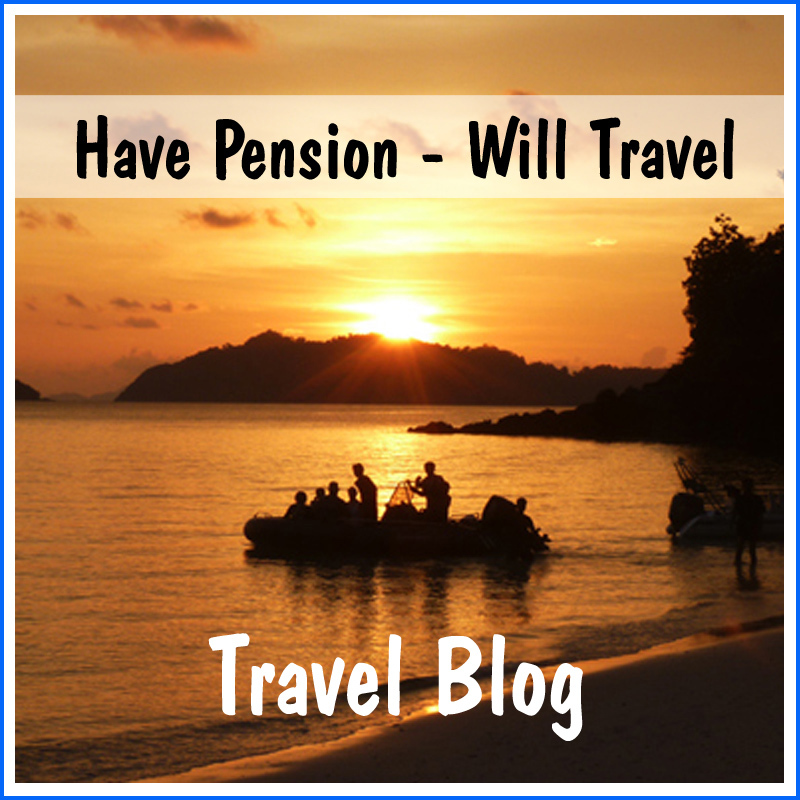 Boat and air fares cost hundreds of thousands of dollars and times are hard! And in two years’ time the Cook Islands will be celebrating 50 years of self-governance. Now that will be a reason for major festivities so beginning to save up for it sounds sensible. The only problem is that government budgets tend to tackle one year at a time; I don’t know if they have the equivalent of a savings account! Anyway, the dance competition should still be a lot of fun especially since our Rarotonga villages (apart from Puaikura) didn’t have dance teams last year – the outer islands beat them to it. Local dancers joined their home island teams of course, but this year it should be village pride on the line. Expect some top notch performances. In the meantime, here is a flashback to last year. The Mitiaro dancers were awarded a B grade for their kapa rima. The things that local participants learned from the recent Film Raro course and festival are already being put to good use. A week-long pearl festival is being planned for April next year and Alexis Wolfgram, one of the Film Raro directors, has been busy putting together a promotional three or four minute film with a website and some 30 second adverts to follow. Some of our course members, including Maureen and Caroline, are particularly interested in the scripting side of a film and they took the original outline – a series of scenes highlighting pearl festival attractions – and added a neat story line about a curious, young mermaid’s journey around the island during the pearl festival. Highlights include events at the Punanga Nui market, a mardi gras evening with a Pearl Princess competition and facepaining for the kids; a treasure hunt; fun team sports at Muri beach; a gourmet long-table dinner at the marina; fashion and wearable arts shows and a Pearl Ball. 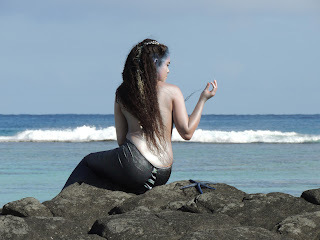 We had a lovely mermaid, Teja who’s just returned to Raro from New Zealand and put in a great performance over the course of a long Sunday’s shooting. 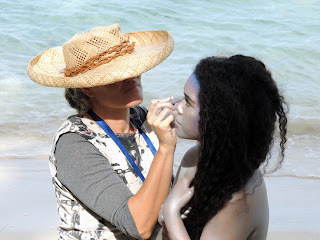 This included wearing a mermaid’s fishy tail in some scenes and having blue and silver make-up expertly designed and applied by Ani. Mel and Pete manned the cameras; most of the props came from Alexis’s Warehouse (a couple of container-sized treasure stores); I helped out with props and locations – making sure we had everything we needed on site and took it all away with us when finished. Most of us also filled in as extra bodies on the set on occasions! I had to go to NZ before it was finished – just got back and I’m looking forward to finding out how it’s coming along. I’ll be putting links to the finished products but in the meantime here are some photos from the first week’s filming. One of the aims of the recent FilmRaro challenge on Rarotonga was to highlight the Cook Islands as a great place to make movies in a tropical setting. Here are some of the locations used by one of the FilmRaro teams, The Offshore Pirate. Locations include Black Rock, Muri beach, and other places. It was billed as a film challenge like no other and it certainly lived up to that. Six teams of film-makers were chosen from hundreds of entries from around the world and flown to Rarotonga in May. Their brief was to shoot and edit a short film and have it ready to show in two weeks. Executive producer Stan Wolfgramm’s plan was to put the Cook Islands on the map as a mecca for tropical island filming. In February Stan and his Film Raro crew started a course on Rarotonga to teach locals the nuts and bolts of film making. We ran through the scripts and script breakdowns then split into groups dedicated to each international team; one each from England and Australia; two from New Zealand and two from the United States. We scouted locations and props, organised auditions, selected possible cast members, discussed costumes and then ran rehearsals. Filming started as soon as each overseas team arrived and then the directors, camera and sound people acted as mentors to their local crew. We filled roles such as production manager, location manager and props manager. We were all volunteers though so not everyone was available all the time because of work commitments. That made things difficult for some of the groups. Film Raro provided three meals a day for the internationals but for crowd scenes with lots of extras we found extra food. The editors were based at HQ, the Aitutaki Hostel where the meals were also served. They started as soon as they had files to work with but film crews were out shooting last minute changes and pick-ups until, in at least one case, the day before the show! We’d hoped to screen all six films outdoors at the BCI stadium but unfortunately it rained all day so the venue was changed to the auditorium. It was packed! The audience loved it and it was a real family affair. Was it all worthwhile? Absolutely! Film Raro is something to shout about. Director/writer Tajinder Hayer and his crew of Mark Bull, Scott Dulson and Darryl Peat hail from Sheffield in the UK. ‘Islands’ is a dialogue and music-free story about freedom and the difficulty of breaking away. Read more on the FilmRaro website here. Director/writer Marcus Hamill with crew Lachie Milne, John Smetana and Toby Deneen produced a fun film about the Million Dollar Corgi Quest with a more serious side that looked at the ties of family and land. More here. Director/writer/editor David Gould with crew Raquel Sims, Simon Godsiff, Joel Anscombe Smith and Graham Smout. In ‘The Seed’ an old Rarotongan fisherman shows a young New Zealand boy that telling the truth can bring unexpected rewards. More here. Director/writer Karin Williams with crew Fred Renata and Sandy Wakefield. Karin is in fact a Cook Islander so she knows all about the beautiful scenery and friendly people of Rarotonga. This documentary takes advantage of both to tell the story behind Mou Piri, a romantic song that is now performed at weddings around the world. More here. Director/writer Erin Lau and the crew of Bryan Ruiz, Jamie Poliahu and Kristin Kouke are all students at the University of Hawaii, Manoa. ‘Little Girl’s War Cry’ looks at domestic violence through the eyes of a 10-year-old girl. More here. Hollywood came to Rarotonga with producer/writers Robert and Webster Stone with their adaptation of an F Scott Fitzgerald short story. Together with director Eric Heimbold and camera operator Hagoth Aiono they visited Rarotonga on a recce of the island in early May then were joined by Nick, Brooks, Trent, Brett, Claude and Kirsten when filming started. In true Hollywood style, Pirates features adventure, romance, a grand dance scene and, of course, a car chase. More here. So many people turned up to the first screening that the auditorium was filled to capacity, 2500 or so, and over 1000 people had to be turned away. They turned out for a second screening the following night and many others came along for a second look at all the movies. The teams have now headed home where they will re-edit the footage and get it ready for sending to film festivals around the world. Fantastic publicity for the Cook Islands! Eventually Stan and Film Raro will produce a DVD of everything but that won’t be available until after the movies have appeared in film festivals. They would be barred from entering if they were generally available beforehand. Worth waiting for though. Check out the FilmRaro Facebook page for heaps more photos and comments. The Rarotonga International Triathlon took place a couple of weeks ago but I’ve been involved with FilmRaro, a film challenge in which six overseas teams came to Rarotonga and spent two weeks making and editing films; all six were shown last weekend. Fantastic! More about that in a future post. Back to the tri. Seventy-nine individuals and 26 teams, mainly from the Cook Islands and New Zealand, took part in this, the nineteenth international, and for the first time in several years conditions were perfect; calm lagoon for the swimmers, very little wind to hamper the cyclists and clouds overhead to keep the runners (relatively) cool. Katu Teiti got things underway with a stirring chant before the swimmers splashed out on their 1500m circuit of Muri lagoon. First out of the water was New Zealander Dave Vernon (19m 38s); he was almost two minutes ahead of last year’s winner Stephen Farrell then followed local girls Vanessa Woodger and Kelly Pick. The 41km bike leg goes anticlockwise along the main road with a loop up Hospital Hill and around the airport on the back road. The interior of Rarotonga might be mountainous but Hospital Hill is the only section of road to provide any kind of climb. By the time he got back to the Ngatangiia sports field (Nukupure Park) Vernon had increased his lead to about 4 minutes before heading on to the 10km run. Vernon led from start to finish and came home with a time of 2 hours 7 minutes 16 seconds. Stephen Farrell was second (2:10:13) with top local triathlete Roland Neururer third (2:12:51 – a local race record). Vanessa Woodger was first female and ninth overall (2:22:33 – a personal best). See more at Cook Islands news here. The nineteenth Rarotonga International Triathlon was held on 11 May 2013. Besides the main triathlon, several other sporting events take place and the first of these is the Boiler Swim. This year's winner was Stephen Farrell (NZ) in 10m 28s. He was followed by local girls Vanessa Woodger and Kelly Pick then Carlswell Bain (NZ) and local paddler John Beasley. Next video up will be of the triathlon. Other events include the Hash House Harriers fun run on Monday, Turtles Tour de Raro round-the-island cycle race on Tuesday and the Matutu Mile on Wednesday. Cook Islands Cricket has big plans for the development of the game, in fact it's hoping to establish 50 new junior teams across six islands during 2013. That's ambitious! So far this year we've had a women's tournament and a national team entered in the Pepsi ICC Twenty20 trophy in January (won by PNG) and during the recent school holidays CIC held an under 19 development tournament for boys. Four teams took part: the Wale (Pukapuka) boys playing for Tupapa, Titikaveka, Turangi-Ngatangiia and the national development team. The tournament took place over three days at Raemaru Park in Arorangi with each team playing six 15-over matches in that time. The final game between Tupapa and Titikaveka was a crunch affair as Tupapa had won all five previous matches while Titikaveka had just one loss. If they beat Tupapa games would be tied and there would be a run-rate countback to find the winner. However, it wasn't necessary as the Wale boys went through the tournament undefeated to win the tournament trophy and a cheque for $275. Pastor Tekaria from Titikaveka was the top batsman having scored 176 runs in six matches. David Piakura from Turangi-Ngatangiia was top bowler with 15 wickets. Roland Mino from the national development team was top fielder. More junior tournaments are planned including ones for under 19 women, under 16 and under 10 boys plus an under 13 world cup tournament for girls. Here's another short video from the 2012 Te Maeva Nui (Constitution Celebrations) cultural dance competition. This video shows the southern group island of Aitutaki with their ura Pau (drum dance). Aitutaki was awarded an A grade for this item. Don't forget that if you're interested in the best of Cook Islands culture and dancing your can buy videos (DVDs) of 2012 and previous years Te Maeva Nui and Dancer of the Year competitions. Available from the Ministry of Cultural Development. Here is another video from Burma (Myanmar). Mandalay itself was a short-lived capital of Burma but the surrounding area hosts several former capitals. Sagaing was capital of an independent Shan kingdom in the 1300s. (Mandalay is in Shan State). Innwa (or Inwa, or Ava - take your pick) was a capital for almost 400 years from 1365 until 1841 with a couple of brief interludes. In 1841 the capital moved to Amarapura but this was another short term event as the penultimate Burmese king Mindon Min moved to Mandalay in 1861. Nothing much remains of any palaces in these towns because the kings used to dismantle then rebuild them on the new site. Recycling to the max! The palaces were built of wood, teak, and intricately carved so it was worth doing. There were, and still are, plenty of monasteries, pagodas and stupas. Sagaing is sometimes called the Vatican of Burma because it has hundreds of stupas, monasteries and nunneries and thousands of monks and nuns. Amarapura is now a modern town. Its most popular tourist site (and possibly Burma's most photographed) is U Bein's bridge - the world's longest teak span. The Mahaganayon monastery is near the bridge. Here, every lunchtime, hundreds of tourists watch thousands of monks line up for their last meal of the day. Here's another short video from last year's Te Maeva Nui dance competition. This one is of the northern group island of Rakahanga with their reo metua (legend) or pe'e (chant). This category has been called the pe'e in the past but in 2012 it became the reo metua on the programme. The chants always involved legends or historical events from the islands concerned, based on the theme of the competition (this time it was "Traditional language of our communities and islands". Rakahanga received a B grade for this item. Burma is in the news again and for all the wrong reasons. Fighting between Buddhists and Moslems in central Burma has left over 40 people dead, with shops, houses and mosques set on fire and thousands of people fleeing their homes. Gangs of Buddhists, including monks, have been roaming the streets attacking Moslems. This sounds like horrifying behaviour but all Buddhist boys are sent to a monastery at the age of about seven for three months or more. Then at the age of about twenty many return to the monastery for a longer period. Some, but not all, of these men will become fully fledged monks and may remain monks for life. Well, there are good and bad people everywhere and clearly some monks are just thugs in maroon robes. According to Wikipedia Burma “… is the most religious Buddhist country in terms of the proportion of monks in the population and proportion of income spent on religion.” But with 500,000 monks in the country it’s not surprising there are some bad ones. The latest round of communal violence started in Meiktila, a town about 90km south of Mandalay. This video was filmed in November 2013. At that time the violence was taking place in Rakhine division in the west of Burma. Most other places were peaceful. I hope they soon become that way again. I loved Burma; I loved the Pandaw cruise down the Ayeyarwaddy River, the people and places we saw. With both tourism and violence now increasing I guess we were there at a good time but I’d like to go back. There is so much more to see. Many people have heard the song “The Road to Mandalay” – there’s a short excerpt from a version sung by Australian baritone Peter Dawson. The words are a poem by Rudyard Kipling who never went to the town! It was the capital of the last Burmese kingdom but that was very short-lived. Mandalay was founded in 1857 and the British captured it in1885. It is now a city home to close to a million people. Pacific islands, including the Cooks, have a real problem with obesity. More than 80% of Cook Islanders are overweight and this can lead to non-communicable diseases – NCDs - like diabetes, high blood pressure and strokes. To push home a healthy living message, public health staff recently organised an NCD Awareness Carnival in the middle of Avarua. 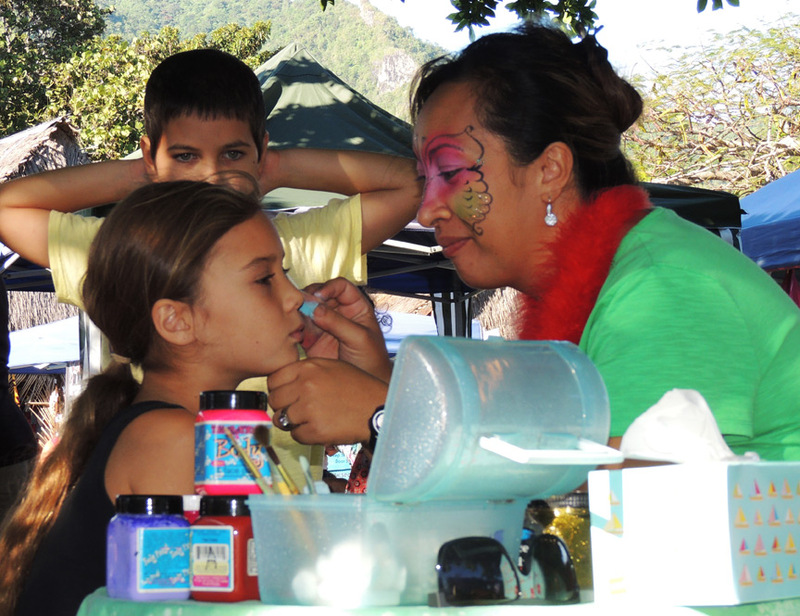 The road through the centre of town was blocked off with a number of free activities available. There was plenty of fresh food available and and vegetable seedlings and fruit trees were being sold by both the agriculture department and Tereora college students. People queued up for free health checks checking height, weight, blood sugar and blood pressure. The health department will be following up anyone showing danger signs. On the exercise front, school kids took part in football and rugby related activities. But the highlight was a mass zumba street party with hundreds, young and old, local and tourist, joining in despite the heat. The carnival was part of an awareness campaign challenging Cook Islanders to “Live 5:30” – eat 5 servings of fruit and veges and do 30 minutes of exercise each day. Here's another item from the 2012 Maeva Nui cultural dance competition. As with all drum dances, Manihiki's ura pau was energetic and a real crowd pleaser. It received an A grade from the judges. At last! Here's another short video from the 2012 Te Maeva Nui cultural dance competition.This is of the Pukapuka kapa rima (action song) for which they were awarded a B grade. No time to write more as I'm about to catch a plane to New Zealand for a bit of a break. It seems like ancient history but at last I’ve had time to finish editing a short video of the 2012 Sevens in Heaven, the Cook Islands annual international rugby sevens tournament. It took place in November 2012 with sixteen men's teams taking part. Some were overseas teams, some of our sides had imported players while a couple were entirely local. There were no women’s teams this time but organisers are hoping for a women's section in 2013. It’s always popular with the spectators. We were lucky with the weather once again with three days of sunshine. That must have made it hot work for the players but nevertheless there was plenty of on-field action. And as usual the organisers arranged fancy dress, goal-kicking and dash-for-cash competitions as well as entertainment by the local zumba fraternity (or should that be sorority), the Swag It team. By the way, the poster frame for the video shows the Swag It team - unfortunately YouTube doesn't give you much choice of what picture to display. In the end the Teimurimotia Stallions from Titikaveka took out the cup after defeating the Tauae Bulls in the grand final. It was the Stallions’ first time in the tournament - being coached by sevens=legend Eric Rush obviously paid off! The star-studded Bulls, led by Rene Ranger, are previous winners but 2012 was not their year as the Stallions beat them by 31-19. Our journey down the Irrawaddy River on the RV Katha Pandaw was supposed to take in two pottery villages but the first, Nwe Nyein, was on the far side of the bridge that collapsed in Central Myanmar’s 11 November earthquake. New Nyein is famous for its glazed pottery, in particular 50 gallon hand-made water pots. (See earthquake damage video here). The second village, Yandabo, is famous for its terracotta pots, made from the riverbank clay. It was also the place where, under a tree on the riverbank, a peace treaty was signed at the end of the first Anglo-Burmese war in 1826. This treaty financially crippled the country but the Burmese still fought two more wars before the British swallowed the whole country in 1885. Yandabo now is a village of some 350 houses each of which is home to from 5 to 10 people. Thirty of the families are potters; the other villagers are farmers, fishermen or suppliers of raw material such as clay or wood for the kilns. The women make the pots and it’s a two-girl job with one person potting while the other operates the wheel using a treadle. The women also decorate the pots and arrange them in a circular pattern to dry. There may be up to three thousand pots in a single layer that’s covered with a large pile of ash, straw and wood then set on fire. The temperature in this kiln reaches 1200C and firing takes three or four days, including cooling. At the end of the process the pots have changed from dull brown to a brilliant red colour. The ports are transported by boat all over the country. Yandabo also has stupas (every village does), a monastery and a primary school that is supported by Pandaw. It was holiday time while we were there but most of the children turned up to see us although they were in mufti rather than their usual green and white uniforms. All the schoolchildren in Myanmar wear green longyis or shorts and white shirts; this represents purity and growth. Incidentally, the first song the kids sang was about an elephant; I am a big elephant and you’d better get out of my way or I will walk on you! I like travelling by train. You can get up and move around which you can’t do on a coach or bus and the scenery’s more interesting than from a plane. There aren’t any railways on Raro though so I have to make the most of them when I’m overseas and that’s what I did in Myanmar. The railroad was built by the British when they colonised Burma in the mid to late 1800s, and I don’t think much has changed since then. Burmese trains are narrow gauge and very old. They rattle and roll and quite often jump and bang as well, all at the same time. However, they are still running so we took one from Pyin Oo Lwin to Naung Pain in northern Myanmar. This particular route crosses the Gokteik gorge over the Gokteik Viaduct that was once the second highest railway bridge in the world when it was constructed in 1901. The Japanese occupied Burma in 1942 and the Americans bombed railroads and bridges, including the Gokteik; it was repaired after the war and is still standing in spite of a lack of maintenance reported in some guide books. We caught the train at Pyin Oo Lwin station and it was a bit disconcerting to see railwaymen levelling up the tracks with pickaxes while we waited. We were in an upper class carriage but that's not as grand as it sounds as it was well past its use-by date. The seats were wide but they no longer reclined and the seat padding must have seen many thousand backsides! Our guide said that only foreigners are allowed to travel upper class (on this particular train anyway) but that doesn't apply to the military, police and railwaymen. One policeman joined our carriage - in full uniform, wearing a helmet that he never removed and a webbing belt with a vicious looking knife, and carrying an AK47. He sat just opposite us and it rather cramped my style when it came to shooting video. I made a point of not aiming the camera anywhere near him. Actually he looked like a pleasant young man but you don't take chances with people carrying large guns! The viaduct is about 700m long and 100m high and the train travels very slowly, at about 5km per hour, as it crosses. The scenery was spectacular and it was a great experience, one of many in Myanmar.